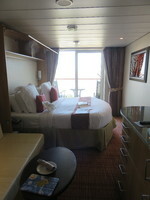 We chose the cruise for the destinations and they didn&apos;t disappoint. 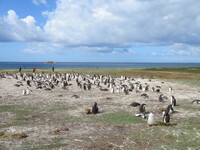 Antarctica and the Falklands were were every penny to get there. 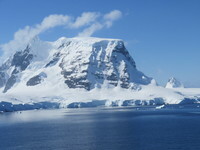 In Antarctica you don&apos;t get off but we saw so much from the ship. 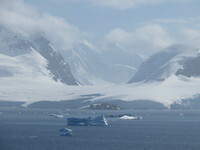 There were lots of whales, icebergs, penguins and incredible scenery. We didn&apos;t do any ship excursions but booked tours through Trip Advisor. The ship has some problems and it was our first time on Celebrity. They don&apos;t seem to understand their guests and activities were hit and miss. The Celebrity Live experts were outstanding - Mickey Live, Celia and Peter were incredible but the live musical acts were all too loud and some of the guest performers were awful. Trivia was well attended every day but the woman running it was pretty thick. She couldn&apos;t pronounce many of the words and was certainly no help when there were questions. Embarkation in Buenos Aires is awful. We waited over an hour to go through security as they have a numbered system. Even though no one was in the security line, they didn&apos;t call the next number. You get through check in and then board a bus through the busy port. The buses had a very high step to get on and then were packed to indecent contact! Getting taxis at disembarkation is easy and very well organized. It is a fixed rate and clearly told up front. The drinks package was very handy with so many days at sea especially in the cafe and at breakfast with the better coffees and fresh orange juice. We got the internet package for one device and could switch it between us. The speed was surprisingly fast and it kept us connected with the news from home. Our balcony concierge cabin was a highlight and we loved the concierge service. The service was impeccable. Food was so so. I&apos;m sure they are trying to drive people into the paid restaurants but that will backfire. We will choose a different cruise line instead. This was our first time on Celebrity, we have always been on Royal Caribbean. In comparison, the food and entertainment was better on Royal. Beautiful cabin, close to the back and very spacious. The curtains wouldn&apos;t close which was a pain in the ungodly hours of an early sunrise. 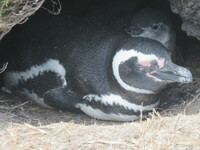 The beds were comfortable and room temperature perfect. 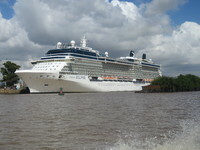 We spent 4 days pre cruise in BA. It is very walkable but we also did the hop on hop off bus. It&apos;s a great way to get your bearings. Another day we took a boat up to the Delta to see Tigre. It is like cottage country and only accessible by water, but was a nice day out. It was booked through the hotel and was $20 cheaper than someone who had booked through Viatour! It included lunch and some time in the market before being driven back in a minivan. 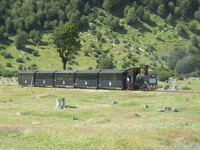 We stopped at San Isidro and then back to our hotel. we walked off the ship and there were travel companies offering tours for $20US each. We decided to do it and were very glad we did. It was a small mini bus and we were able to get out at each stop for as long as we wanted to take pictures. It included a 30 minute stop at an indoor market and ended with the Montevideo sign. 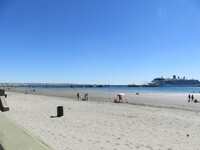 We booked a private vehicle online and were met at the pier by Wayne&apos;s tours. It was a Land rover that was shared with another couple who we had never met. They were Americans who had never heard of the Falklands War. It made for an uncomfortable journey as we were tightly squeezed into the back. The roads are so bad that it would be worth paying extra to be in a vehicle for 2. 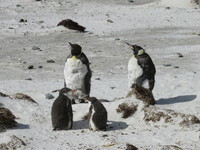 We were driven 1.5 hours to Bertha&apos;s Beach to see the colonies of Gentoo penguins and a pair of Kings that were on the beach moulting. It was incredible. 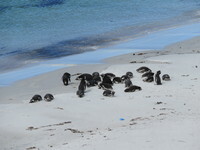 We then went back to Stanley and Gypsy Cove for the Magellanic penguins that nest in burrows. 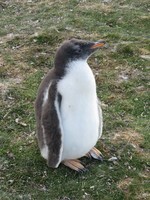 Our driver was a native Falklander and was very entertaining. She was a 30 year old mum when the Argentinian&apos;s invaded and was able to give us a first hand account. We were dropped off in town and did a bit of shopping. 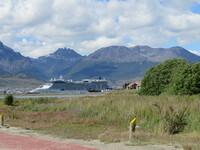 The town is tiny and the cruise ships triple the population. Everything was crowded and the queue to get back to the tenders was quite long. Celebrity kept it moving though and we were soon back on the ship. The ship docked at 8am but nothing in town opens before 10am. We walked around a bit and then took a 20 minute taxi ride to the Train to the end of the World. We booked the VIP seats on the train in advance through Trip Advisor. It was totally worth the extra expense. We got a choice of hot meal, I had lamb stew and hubby had a chicken wrap, both were great. There was also a choice of three drinks, alcoholic, hot, pop or water. We also got 5 gifts including a calendar, key rings, cakes, our photo and magnets. The rail car was just for us and we felt very spoiled! The ride is 1 hour out and back. It has beautiful scenery in the Tiera del Fuego National Park and travels slowly enough to see everything. There was a short stop at a waterfall and commentary in Spanish and English. We did get off at the turnaround and walked down a steep hill to the water. This is where you can mail cards or get your passport stamped from the end of the world. It&apos;s a tiny converted container and the passport stamp is $3US. We got ours from guest services before leaving the ship. The walk down the hill was dusty and hot and we were glad to get a cab to take us back to the top for $5. It was easy to find a taxi after the train got back to the main station. There is a good souvenir store at the station.